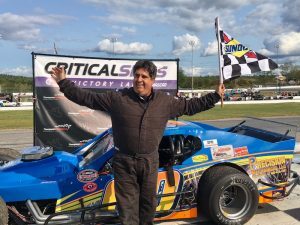 THOMPSON – On Sept. 1 Glenn Griswold snapped an extended winless drought by grabbing victory in the SK Light Modified feature at Stafford Motor Speedway. Sunday at Thompson Speedway the Vernon driver kept the hot streak rolling. Griswold got by Chris Viens for the lead on a lap 12 restart and went on victory in the 20-lap SK Light Modified feature at Thompson Speedway. “It’s a little rejuvenation for the old guy,” the 54-year old Griswold said. Glenn Korner Jr. of Canton was second and Bert Ouellette of Ellington third. Griswold stalked all over Viens for the opening laps before caution flew on lap 12. On the restart Viens opted to start on the inside and the decision proved his demise. Griswold easily took over the top spot for good when the green flag came back out. In his first event back since sustaining a crushed left foot in a work accident, Ryan Morgan of Mystic got the victory in the 25-lap Late Model feature. John Warren of Chicopee, Mass. was second and Matt Lowinski-Loh of Milford, Mass. third. Scott Sundeen of Douglas, Mass. got by Steve Kenneway for the lead on lap 19 and went on to win the 20-lap Limited Sportsman feature. Brent Gleason of Lisbon was second and Kenneway, of Lowell, Mass. third. Dave Trudeau of Mansfield held off Jacob Perry of Pawcatuck on the final lap to win the 15-lap Mini Stock feature. Where were the 70 and 9 in the late model race. I guess they were still pouting after being DQ’d last race. Glad to see the others come back to race and just take their the punishment. 7 sk lites? Why don’t they just give it up already, like they did once before. Shame on the 70 for not running the race. I believe Brian Tagg was saving his car for the ACT late model race at Loudon .